Very definitely. We've already had some chilly mornings but it's now cold, grey and very windy. My apartment is fairly sheltered as it's in the corner of two wings of the building and basically faces north. However there's no sun today and even the shrubs in my planter boxes on outside edges of the balcony are blowing fairly wildly. The flag on the horizon from the girls' school on the hill is flapping madly. I woke yesterday to a strange pinkish light in my bedroom. When I got out of bed, this sky is what I saw. The photo is taken looking northwest, but there was just as much to the north east. I was reminded of the old saying, "red sky in the morning, shepherds take warning." I went shopping early and when I returned to the bus stop, a change had come through and it was cold and grey. There was a similar sunrise this morning but not as extensive and it's quite unpleasant. The photo was taken with my phone as it was on my bedside table. Over the year I have learnt to take sky photos immediately. If I get the big camera and focus it properly the wonderful light has usually gone and I'm left with a fairly average photo. So the phone was it. The ragged edge along the top of the high wall on left is actually made by about 40-50 cockatoos. They gather there every morning with their backs to the sun, waiting for the first lot of sunshine to warm them up. I usually enjoy recipes from Delicious magazine and I have a subscription to it. I found one the other day for ginger chicken with coconut rice. It sounded my type of dish and I had everything but the chicken and peanuts so I bought some yesterday. I cut down the dish or I'd be eating it for days, even freezing some. However, I cut down the other ingredients in proportion. 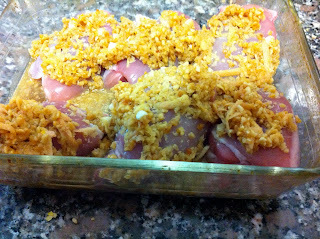 Grated fresh ginger, lime juice and zest, garlic, peanuts, fish sauce and a bit of brown sugar. 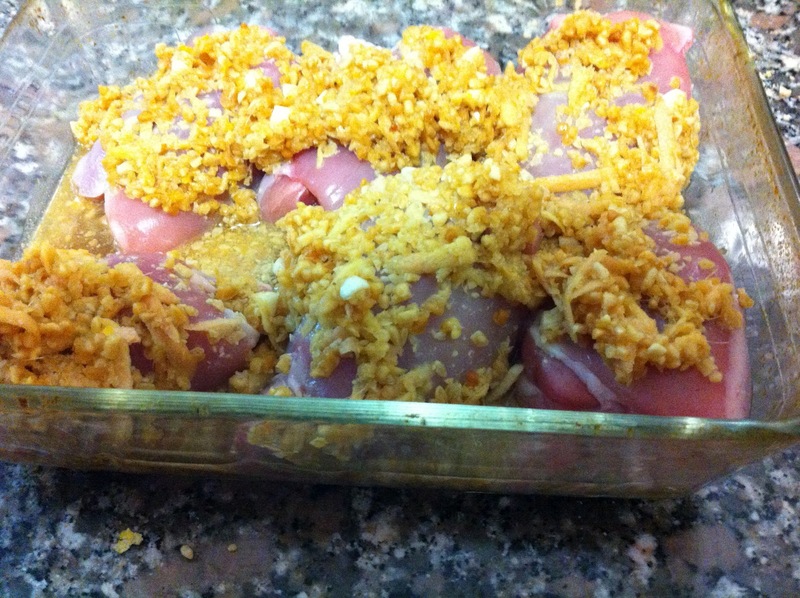 The chicken is marinaded in a mix of the above and then browned and baked with more peanuts on the top. Coconut milk is stirred through the rice. It looked good and the topping with the nuts was nice, but the whole dish was a disappointment. I found it bland which surprised me as there was quite a bit of fresh ginger in it. I still have at least another meal so may try to liven it up somehow. The picture shows the dish before it went into the oven. I was disappointed as usually recipes from that magazine are good and most are not complicated. What I did like on a cold, unpleasant day was a hot drink made with boiling water and fresh grated ginger. I have a stuffed head from a cold and it did a good job in clearing that while tasting warming and pleasant. My mystery shawl is coming along. I caught up on what I had missed last week and was onto clue 7/9. I remarked that the shaping is strange, A huge increase in stitches on one row and no gradual shaping as is customary on a shawl. However, I was reading in the forum for the shawl on Ravelry and have had another thought. I've just done another doubling of stitches. This makes a mound on the edge of the shawl and then another thirty or so rows before another doubling. The shawl is based (fairly loosely) on the characters in the actual fellowship of the ring from the The Lord of the Rings trilogy. Different characters are represented by different lacy stitches. But what about Boromir who died? I had changed to a longer cable and shawl shape opened out a bit. My guess is that the shawl will be a shield shape. The designer has made no mention of Boromir and has just commented that there is something hidden to be revealed. We'll see. However, just after the stitch count went up to nearly 400, I found a mistake. I could not work my way around and have had to unpick almost 800 stitches and start that repeat again. Not happy Jan! Indeed I was not happy. 800 stitches of lace. Aargh! I wouldn't be happy either! I dislike anticipating a delicious meal and then find it's turned out bland - we had that problem with the first few meals we made in the slow cooker! But now I think it's a great investment - I sit here, catching up with blogs and enjoying the aroma of tonight's dinner while waiting for the washing machine to finish its cycle. Then I can put the "do not tumble dry" sheets (how ridiculous) I just bought to make up a bed for mum who arrives this evening into the dryer!! How else am I to dry flannelette sheets on this rainy day? After catching up with blogs I have sock toes to graft, presents to wrap and a shopping list for Sunday's birthday lunch to write! Ah, ain't life exciting? Oh my! : not a knitter, but given the numbers I feel your pain. That recipe does sound so nice and it is disappointing when the flavours are bland. I have read about fresh ginger tea, I made fresh mint tea, so I must give this a go. I hope your cold passes quickly. Oh no, 800 lace stitches, what a pain, though the shield shaping sounds so interesting. Yes it's very cold here, minus 4 last night. I keep saying it as I can't believe it!! hullo! I can see you in there!